In opening arguments, Defense attorney Ed Chernoff told jurors that Jackson, of his own accord, swallowed several lorazepam pills on the morning of his death and that was enough to put people to sleep. He also claimed Jackson self-ingested the anesthetic propofol, creating a "perfect storm in his body" that killed him instantly. Chernoff said Murray and Jackson were actually friends and Murray was trying to wean Jackson off of propofol. Jurors viewed a multimedia presentation which featured an audio recording Murray made of Jackson under the influence of propofol, and an image of the pop star's pale body lying on a gurney after he died from an overdose on the drug on June 25, 2009. Murray has pleaded not guilty to involuntary manslaughter and if convicted, he faces up to four years in prison and the loss of his medical license. 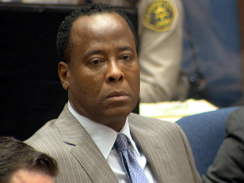 A number of Jackson's family members were in the courthouse for opening arguments, including his father Joseph, mother Katherine, sisters LaToya and Janet, and brothers Jermaine, Randy, and Tito. LaToya Jackson carried a sunflower, Michael's favorite flower.